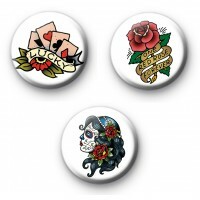 Set of 3 Old School Tattoo Style Badges. You get 3 retro tattoo design style badges in this pack. A beautiful sugar skull, a rose with the script one red rose forever and playing cards with the script lucky. These are bold, vibrant and fun badges. All our pin badges are 1 inch.